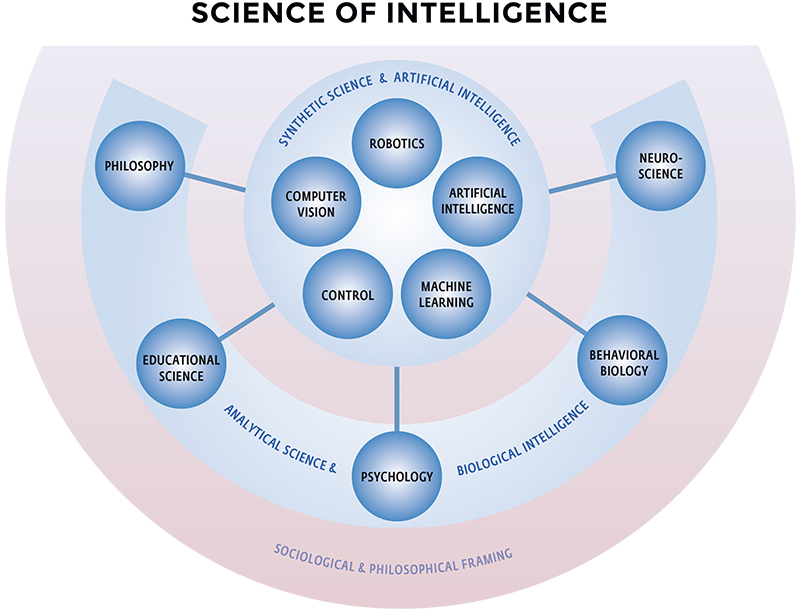 We devised this structure to avoid problems of traditional intelligence research and to accelerate “growing together” of the involved disciplines into an integrated Science of Intelligence. We describe these four research units below, motivate their design and show connections between them. This research unit implements the synthetic approach to intelligence research, SCIoI’s central scientific strategy. Following this strategy, we gain an understanding of intelligence through the synergistic combination of analytic (usually non-technical) and synthetic (technical) disciplines. In this unit, our key scientific objective is the analysis and synthesis of complex, integrated, real world, intelligent behavior, as opposed to functional components of that behavior. We believe that the classical decomposition of intelligence research into researching individual functional components has actually hindered intelligence research, because intelligent behavior should not be factorized into functional components. By targeting full behaviors, we do not make any assumptions about the functional components required to produce it. Each project must assemble and interconnect the required functionality in appropriate ways, so that the behavioral hallmark of intelligence is synthesized. This allows us to address the non-decomposability of intelligent behavior holistically. We are able to have independent projects without being in conflict with our assumptions because behavior is the “whole”, and we do not prescribe a particular degree of modularity as long as the entire behavior is synthesized. One might be tempted to compare the outcome of a project with an individual of a particular species living in a particular ecological niche. Three example behaviors will form central, integrative themes of this research unit. These example behaviors capture the representative, intelligent behavior (1) of a single individual, (2) of several individuals interacting in a social setting (social intelligence), and (3) of many individuals exhibiting intelligent behavior in a distributed manner (collective intelligence). We use these three example behaviors to structure this research unit. Each of these behaviors bundles research components. Individual projects in these research components also produce (simpler) behaviors which then contribute to at least one of the three example behaviors. In addition, research components will also perform fundamental research that goes beyond the example behavior. The example behaviors serve as an integrative activity, designed to overcome the fragmentation of existing disciplines. If principles of intelligence exist, they must be reflected in the instances of intelligent behavior researched in Research Unit 1 (Synthesizing intelligent behavior). This Research Unit 2 will extract principles from those instances. Projects from this research unit formulate hypotheses about principles of intelligence by abstracting and generalizing observations shared across many of the projects in Research Unit 1. From these generalizations, we are able to formulate hypotheses about principles of intelligence. These hypotheses in turn can be disproven or supported by investigations in the discipline-specific research of projects from this unit. For example, there might be several projects in the Research Unit Synthesizing intelligent behavior that provide insights into the research question modularity versus integration (“can intelligent behavior be factorized into exchangeable modules or is it necessarily integrated and indivisible as a whole”?). In our example, a project from this research unit interacts with those projects to identify, generalize, and abstract commonalities. These shared observations in turn lead to the formulation of hypothesized principles. The project can now instantiate and apply the resulting hypotheses in the context of a discipline-specific problem and thereby either disprove the principle or provide experimental evidence in its support. The synthesis of intelligent behavior in the Research Unit 1 (Synthesizing intelligent behavior) is limited by available synthetic methods. To ensure that the synthetic tools available to the project “grow” with our understanding of intelligence, we must advance the state of the art in the synthetic sciences and provide this to Research Unit 1. This includes the investigation of the limitations of the state of the art, the extension and advancement of existing methods, and the development of novel methods. SCIoI assumes that human, animal, and artificial intelligence share a common set of principles. And SCIoI assumes that the proposed combination of analytic and synthetic disciplines provides an appropriate methodological tool to study those principles. These assumptions must be investigated as part of our scientific endeavor. Furthermore, the study and synthesis of intelligence raises important ethical questions. These questions, too, must not be ignored in an endeavor of this magnitude and potential impact. The Research Unit 4 (Sociological and philosophical framing) is designed to address these aspects of SCIoI that cut across all of the aforementioned research units. All projects in this research unit must address basic conceptual, methodological, or ethical questions raised by SCIoI as a whole or by its individual projects. These projects must feed back their results into the internal discussion of SCIoI, enabling PIs and projects to take advantage of these findings. The overarching goal of this research unit is to steer a process of convergence within the consortium regarding conceptual, methodological, and ethical issues.